One of the mom’s I’m getting to know well here at Sick Kids has a daughter Aleeda. And Aleeda has the same heart condition as Ava, but after her second surgery last summer her heart function was so poor that they said she needed a heart transplant. And so the wait for a heart began. And 7 months later they are still waiting. And the waiting is hard, because Aleeda is not getting better, it seems she’s getting worse. And since January 2nd when we got here to the fourth floor with them, two other baby’s have received hearts – and they haven’t been waiting as long as Aleeda. And it’s hard to understand. And this mom does have a strong faith in God and knows that God has a plan for her daughter, but it’s so so difficult to see your daughter deteriorate and know that unless a heart comes soon…. well I think you get the picture. 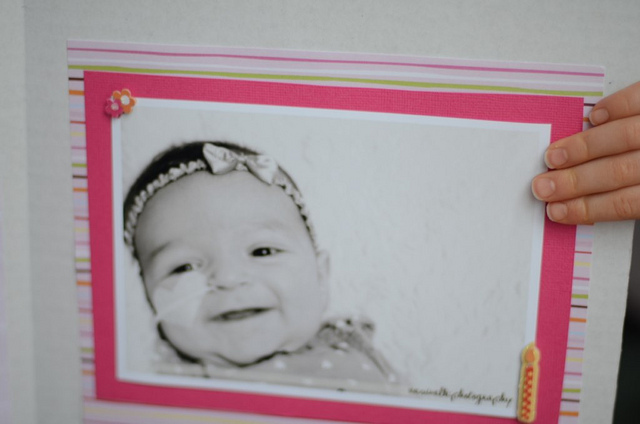 And Aleeda’s first birthday is next week – and I was just on Ann Voskamp’s blog, A Holy Experience and she did a beautiful post that talks about Aleeda and how they are a part of wanting to give Aleeda 1000 birthday cards for her birthday next week!!!! Knowing that even if we can’t get her a heart, we can still show God’s heart for her. He does love Aleeda and He has a plan. And I will pass them along. Oh please God, hear our prayers and provide Aleeda with a heart! I love this idea!! BTW it was really cool meeting you yesterday with Lauren! You and little Ava will be in our prayers! Love that idea! I teach at Sarnia Christian School, and many of our students will be making cards to send out tomorrow after school. Can you tell me who’s name to address them in care of? Please let us know who to address the cards to. Bless sweet little Aleeda.